Thanks to Professor Brian O'Blivion of The Cathode Ray Mission for another blogger award meme nod! It's much appreciated as a nice gesture and way of periodic cross-blog name-dropping! The Professor has been on BoGD's blogroll forever and for good reason! I'll plan out my own little award ceremony later this year. 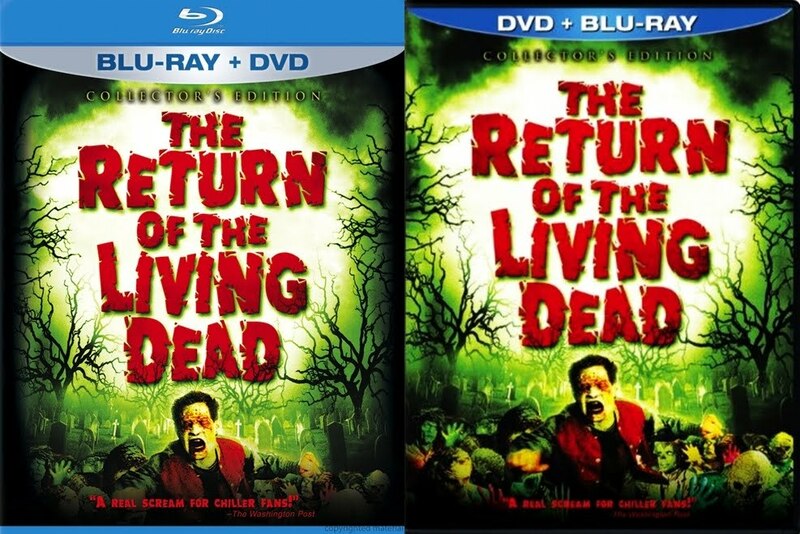 Concerning the Blu-ray/DVD set of Dan O'Bannon's essential The Return of the Living Dead coming on September 14th, MGM/Fox has seen it fit to provide the combo in both a standard Blu-ray case or DVD case. Not unprecedented, The Usual Suspects HD/SD set arrived in a DVD case, but odd considering none of the other duo-format releases announced with Return having the option (including 1978's Invasion of the Body Snatchers). No specs announced yet, but given both denoting "Collector's Edition", one of the discs (most likely the DVD) might have the supplements of the existing CE. I'd expect the usual 1080p transfer and lossless DTS-HD Master Audio 5.1 treatment. It'll be interesting to see if O'Bannon's requested audio changes are evident on the lossless track or only affected the old Dolby DVD tracks. Also if anyone pre-ordered this one using the non-affiliate link I posted a few days back, that link became the DVD case release, with the BD case release for pre-order listed here. 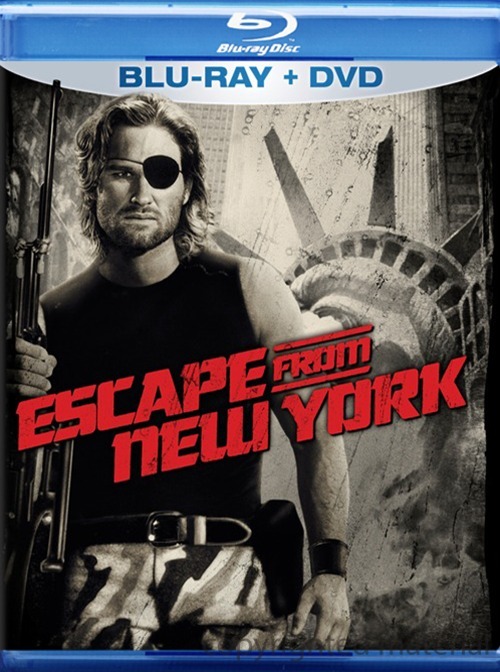 Speaking of Blu-ray/DVD sets, I checked out Escape from New York last night for what seems like the nineteenth time. MGM/Fox's Blu-ray transfer has been the topic of hot debate on many A/V forums since its release last Tuesday. The 1080p/50GB picture quality is extremely dark and drab putting some viewers off and resulting in charges of the transfer being poor. Although this classic lean post-apocalyptic roughie's high def treatment certainly isn't weak. Fine detail and rich color shine throughout the runtime, but yes, the film is borderline ridiculously dark. Yet no murkiness in the shadows is evident. The darkness will be a torture test for display types given to posterization (see here). There are many examples of inherent blur around the edges of the 2.35:1 frame. When EFNY was shot, Carpenter's beloved Panavision was notorious for being tough to keep in perfect focus, especially with alterations during live shooting. So no, this Blu-ray never is quite tact sharp, but you can chuck the overly soft DVDs in the trash in comparison. The DTS-HD Master Audio 5.1 track is nice; though I'm used to the clarity of the soundtrack CD. The score on this BD sounds rather muddy like always on home video. Finally, to the horror of supplement-hounds, this Blu-ray has zero special features (unlike the 2004 SE), and the DVD is the extra-less widescreen/full screen flipper from a decade ago. Still, the real HD image quality blows away the laughable upscaled DVD transfer seen on the British Blu-ray. Pick this one up before Fox re-releases it with a bunch of extras, but destroys the picture with fifty pounds of pasty noise reduction like their recent Predator abomination. LOVE Escape from New York, one of my favourite movies. And the sequel Escape from L.A.
That Escape from New York is damn cool! Also thanks for the kind words.